The first half of the movie was awesome, it was truly scary. I mean I felt paranoid to go to the bathroom after seeing the first half. It had everything, suspense, a story line, the plot was building up but after that it got boring. The second half did not live up to the first half it was like watching two different movies. It was really disappointing. The second half reminded me of the 1982 movie Poltergeist. And the suspense at the end of the movie is not that unexpected. Here's the story, Josh Lambert (Patrick Wilson) and his family move to a new house. 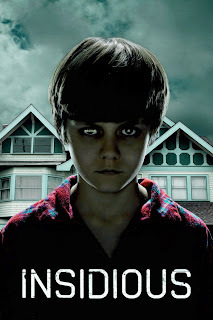 Strange things starts happening around his youngest son Dalton Lambert (Ty Simpkins) who is in a comatose state. Now Josh and Renail Lambert (Rose Byrne) must find out what is causing these strange occurances. They call in Elise Rainier (Lin Shaye) a paranormal expert. Josh soon learns from his mother about his secret childhood. So basically Josh was also experiencing supernatural occurrences when he was a kid, Elise helped him overcome it and to protect him, Elise had to suppress his memory. What happened is, Dalton's body is without a spirit and his body is acting like a magnet attracting all kinds of evil spirits. Now, Josh has to help his son using his childhood secret. So, that's basically it, it is kind of a complicated plot but it's kind of nice at the same time. To sum up, if you haven’t seen Poltergeist maybe you’ll like this move but if you've seen it, then this movie is a gamble, 1st half is good but the 2nd half does not live up to expectations. "It's not the house that is haunted. It's your son."